I just love sketches, especially when they come together as easily as this one. I used MMSC21 for my sketch inspiration. I've been a little busy lately, and haven't had time to play in their sketches, but I sure picked a good week to head over there, as they are giving away a WorkBox - I'll share more information with you below my card. Since it's a bit on the chilly side again today, and my 18th Wedding Anniversary is next week, I thought I'd toss a few ideas around for DH's card. Not sure if this is the one he'll end up with yet or not. I stamped the 3 Step Autumn Squirrel from Kitchen Sink Stamps on White card stock as follows: #3 Black, #2 Close to Cocoa, #1 Memento Desert Sand. Then using the leaves from the new Owl & Autumn Moon set, I stamped the larger leaves under the Squirrel as follows: #2 Close to Cocoa, #1 randomly using the colors in the Pumpkin Spectrum Pad and Memento Dandelion inks. I layered the stamped panel on a piece of Chocolate Chip done with the Torn Frames Technique, then layered on a Pumpkin Pie panel. The sentiment from the Autumn Squirrel set is stamped in Chocolate Chip. The large leaf is from the Autumn Squirrel set stamped on White as follows: #3 Close to Cocoa, #2 Pumpkin Patch, #1 Pumpkin Patch stamped off. After cutting, I sponged the edges to fill in any White space, then adhered to the panel with a dimensional. The Acorn is stamped as follows: #1 Old Olive, #2 Close to Cocoa, #3 Chocolate Chip, sponged and adhered to the leaf with a dimensional. I frayed some Hemp and added it with a Glue Dot. The beautiful printed paper panels are from the Indian Summer pad from Basic Grey - I'm just lovin' this paper for Fall! You can SAVE 10% on all your Kitchen Sink Stamps purchases, just use code LISA10KSS when you check out. This months new release specials end October 1st - click here if you missed that post. Here's the information on the wonderful WorkBox Giveaway from Midnight Madness - isn't this an awesome prize, I just LOVE the raised panels and all the cool storage and workspace this has to offer. I think I've found the perfect spot in my craft room too! The Original ScrapBox has other great products for your crafting needs as well. Have you seen the Storage Drawers - talk about storing your stuff in style! The Original ScrapBox is also offering a discount on shipping, just enter this code when you place your order to get $100 off your shipping: 100Writes. Astonishingly gorgeous! Just a fabulous image and wonderful dp. Just the right amount of embellishments. A true picture of beauty! Thanks for playing the challenge with us this week at MMSC. Hope to see more of your awesome creations. Be sure to check Priscilla's blog for all the fun and give-a-ways! Oh I love this!! Lisa this is one gorgeous 'work of the heart!' I love everything about it! Thanks for playing with us this week at Midnight Madness Sketch Challenge this week, we hope to see more of your beautiful creations. Be sure to check back at the MMSC for all the fun and give-a-ways! I don't think there is much prettier than that Basic Grey Indian Summer paper, unless, of course, it is your beautifully stamped squirrel. I just adore the fall colors. This is so beautiful!! 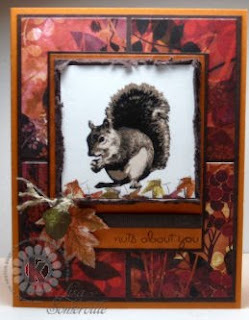 I just love the rich colors and your fab squirrel image!! So fall!! So many awesome details. Great take on the sketch. Thanks for playing with the MMSC this week. I have big blog candy on my blog if your are interested. Your card is so awesome. I love the paper selection as well as your cute little squirrel. I am looking forward to seeing what you come up with next week too! Thanks so much for joining us this week at Midnight Madness. Please join us for the blog hop that is coming up soon! There will be lots of prizes. Also, please stop by my blog and sign up for my birthday blog candy that I am giving away this month! Hi! What a rich fall card! It's just perfect! Your colors and work are wonderful! Thank you for joining us this week!